Leaves just barely starting to fall, crisp under my bike tires during my morning ride; the cemetery by my house gets that September glow -- the headstones looking particularly keen, mossy beds and rust worn faces smiling against the breeze and warm sun. I can feel fall coming. Despite the lingering heat, I find myself imagining the trees painted in jewel tones. This is my first autumn here in Charlottesville, and Logan tells me (often) that it's the best season for this city. With the fall harvest on its way, the trees burning in blushing reds and yellows, and the university beginning to buzz into activity I see why. The anticipation for full-fledged autumn is bringing a lolling smile to my mouth, and a sparkle to my eyes. It's one of my favorite months, anyway. It's my birthday month, and it brings up memories of school beginnings -- beloved opportunities to get nerdy in a community of like-minded book-worms. I have this notion instilled in me that this is a time for prepping the mind for excellent work to come. And what with out chocolate business slowly growing towards launch, it seems the feeling is purposeful. September, for me, has always been a month packed with birthdays. There are a lot of Virgos (and early Libras) in my family. So, inevitably, this time of the year brings up memories not just of first-day-of-school excitement, but also of fluffy birthday cake, colored tissue paper, family gatherings. I love the smell of summer dying to bring life to pumpkin soup, apple pie, and pomegranate sangria season. Logan and I took a trip to Roanoke recently, and found some delicious peanut-butter-chocolate-rice-krispy-bars. These almond butter bars are my take on that treat, but with a white chocolate coating made to taste like classic Indian kulfi. Kulfi is typically a frozen yogurt popsicle spiced with cardamom, rose, and pistachios. I figured white chocolate would be a great pairing with those flavors. Easy to make but complex in flavor composition, these bars are perfect paired with after dinner drinks and good company. 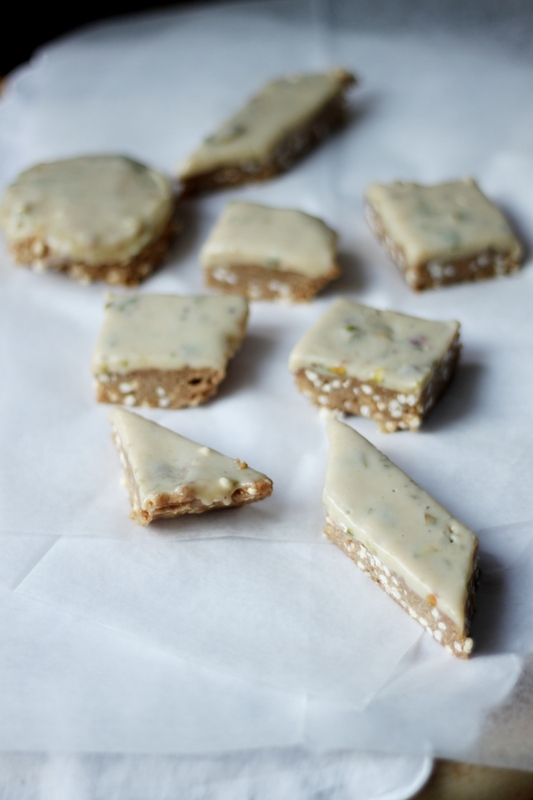 The almond butter bar tastes like raw cookie dough, and the white chocolate is creamy, floral, and nutty. The cardamom, to me, adds an almost citrusy vibe to the mix. I think it would pair well with an orange or lemon liqueor. Line a 9" pie plate (or square baking pan) with parchment paper. In a food processor, combine almond butter, oat flour, coconut oil, agave, and sea salt. Process until the mixture begins to knot up and knead itself into large balls of dough, then stop. Place the dough in a separate bowl and knead in the millet puffs. Transfer the mixture to your pie plate. Press the dough evenly into the plate to create the base layer of your bars. Pour warm kulfi white chocolate over, and freeze for minimum 3 hours stacked between sheets of parchment paper. To serve, let thaw 10 minutes, cut into squares or use cookie cutters to create interesting shapes. Place your white chocolate in a medium bowl, and set aside. Bring your coconut milk to a simmer in a small pot. Cut off the heat, and add the rose petals and cardamom. Let sit for 30 minutes. Strain out the flowers and cardamom seeds using a mesh sieve, transferring the coconut milk back to the small pot. Bring the coconut back to a simmer, and remove from heat. Pour the coconut milk over the white chocolate, and let sit 5 minutes. Stir to incorporate the milk into the white chocolate. Add chopped pistachios, and stir to combine.